Despite announcing his retirement from International Football last September, Juan Riquelme has been named in Argentina manager Alfio Basile's 22 man squad for the Copa America, commencing this coming Tuesday (26th). Riquelme's inspired form for Boca Juniors in the latter part of the season, culminating in their Copa Libertadores success on Wednesday of the week just gone, along with intense pressure from the mainly Buenos Aires based Argentine press, left Basile with no choice but to name the playmaker in his squad. Whether he will be in the starting eleven or not remains to be seen. The previous national boss Jose Pekerman built his team around the mecurial number ten, so it will be interesting to see how Basile will incorporate him into a team where Lionel Messi appears to (rightly or wrongly) have been given the role of playmaker. 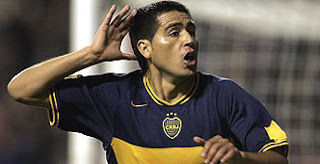 Whether he starts or not, I, for one, am glad to see Riquelme back in the national fold. As well as adding a little something extra to the Copa America, it is also a move that will put him in the shop window for a transfer back to Europe after the competition has concluded, allowing many more people to witness his exquisite skills on a weekly basis.